Anna Hazare and his people’s movement against bureaucratic and political corruption gained massive support from the public from all walks of life in India. Along with bureaucratic and political corruption, the corporate corruption is also thriving worldwide. It is a fact that high level political and bureaucratic corruptions are facilitated by a cross section of corporates. Almost all the major scams in various countries and particularly in India are through direct or indirect involvement of big business enterprises. Apart from the scams and frauds that are products of an unholy nexus of businessmen, bureaucrats and politicians, many companies, large and small, are marred by corruption within itself. This results in large scale diversion of funds and inefficiency which invariably affect the interest of all external stakeholders. Corporate corruption has further strengthened the parallel economy, by moving from the conventional practice of ‘black and white’ transactions to Special Purpose Vehicles and sub-contracts giving a colour of legitimacy to the deals. Such unethical practices have resulted into companies becoming bankrupt and investors losing quite heavily. In an interview reportedly to the Press Trust of India, the Chief Vigilance Commissioner of India said that Corporates may be brought under the purview of Lokpal. However, an amendment proposed by opposition MPs in Indian Parliament to include corporates within the ambit of Lokpal was defeated during a special parliamentary session convened exclusively for passing the Lokpal Bill. At this juncture, one needs to think loudly for an effective watchdog to check corporate corruption. The market regulator Sebi has finally woken up to advocate for the expeditious creation of an independent audit regulator in India. The demand for such a regulator to oversee the audits has come in the backdrop of increasing awareness about the dwindling standards of corporate audits in the country. The lack of effective disciplinary action by the Institute of Chartered Accountants of India (ICAI) has also prompted the regulatory bodies and others to think about the need for an independent regulator. Interestingly, but not certain whether it is an immediate reaction, the ICAI has reportedly barred two auditors of an Indian audit firm from practicing for life and slapped a penalty of Rupees 5 lakhs each on them for their role in the 14000-crore Satyam scam. A probe by an ICAI disciplinary committee has found the above two chartered accountants guilty of professional misconduct while their firm conducted audits on behalf the PWC. The action of the ICAI came as a surprise for many as all along the statutory body maintained a position that what happened in Satyam is not an audit failure but a corporate governance failure. Be that it may, the series of corporate scams and scandals happening in the recent years point towards the deficiencies in the current audit system. Indian laws are not without any provisions to tackle offences by the auditors. The new Company’s Act provides for certain situations in which the auditors can be held responsible for negligence, incorrect statements etc. Apart from the mechanisms of SEBI and Company Law Board, there are internal control mechanisms in the profession through ICAI. However such measures did not create any serious impact in the profession as the deterrence mechanism is very weak. The present powers and responsibilities of the audit committee are unlimited. Members of the Audit committees of many companies lack technical competence and fail in their role as an effective investigator and evaluator. ‘Auditor Independence’- Is it impossible in the current structure? Analysis of the corporate audits in India indicates that the auditor independence has been compromised due to several reasons as mentioned earlier. The problems lie in several areas: Appointment of auditors, payment of fee, audit and non-audit revenues, the threat of loss of contract, self interests, cultural and primordial preferences while appointing auditors, lack of technical competence, financial and non-financial relationships with the clients etc. Added to the above there are problems of lack of uniform and objective standards, disciplinary authority, over sight bodies etc. In the above circumstances it is necessary to think in the direction of making some radical changes. Can we have an Independent Audit Regulatory Authority? As we seen in our discussion and review , there is a necessity for a strong institution to oversee the entire audit work in the country. The set up should have certain necessary attributes. It should be independent, technically competent, representative, multi functional, and with sufficient legal powers. It may be headed by an Auditor General who is nominated by the President of India and should be a constitutional authority with a fixed tenure of at least 10 years. This would make them totally independent of the changing governments in the country. The post should be made constitutional and removal be made only through impeachment. Following structure is suggested for the above authority. The structure consists of various autonomous boards with independent functions as given below. Centralized empanelment of auditors –specialization wise and region wise based on set criteria. Allocation through random allotment from a list of ten preferences given by the client as well as the audit firm) Appointment for 5 years without any extension. As seen above, the independent body can oversee streamlining of the accounting standards. Though ICAI has been successfully involved in the preparation of accounting standards, lately arguments have emerged questioning the ‘objectivity’ and ‘independence’ of the ICAI. The role given to ICAI was only for a limited period till such time the central government constitutes an autonomous body to prepare the standards. Since most of the problems related to ‘auditors independence’ is because of the current system of appointment of auditors, the independent authority can be in charge of empanelment and allocation of auditors. As we entered the phase of competitive business management there should not be any distinction between the standards for private sector and public sector. Both should be under the purview of this structure. It is seen that the independence of auditors are affected because of their dependence on the clients for fee. Therefore a National Audit Fund can be created to take care of the auditing expenditure. The entire expenditure for auditing (the audit fee and other audit expenditure for the auditors) should be borne by the Auditor General Office. Fund can be raised through one or all of the following sources: a) Portion of annual fee by companies, b) A very small portion of the investment of each investor c) a fee proportionate to their annual turnover, and d) Amounts collected as penalties and fines. The public responsibility of auditors as watchdog of companies is very crucial for overall stability and financial discipline in the economy and business. Most of the corporate failures in India and abroad pointed out the ‘audit failures’ in many companies. It is seen that the independence of auditors are under serious threat due to several factors. There is a need for an independent authority to effectively regulate and enforce the audit system in India. The authority should be totally independent of the government and would have uniform standards for both public and private sector. However no authority can be a panacea unless companies and audit firms understand that internal control, personal competency and ethics play crucial role in making the institution more efficient and socially productive. An ideal person need not worry about his privacy, because he is not bothered about someone else becoming privy to his personal data and interests. But all human beings are not ideal persons. And, therefore our society is also not an ideal society. People crave for data and information about others for various reasons. And there are individuals and groups who use the information for criminal activities. In such a scenario, one needs to be guarded about his personal data and preferences. Internet has facilitated faster, cheaper and sophisticated modes of sharing of information and entertainment. But all these are at the cost of privacy. Commercial interests of the service providers overtake the interests of the users in due course. As the domestic and international rules and procedures related to internet lack lucidity and perfection, users are in a disadvantageous position to understand the negative impact. Google is one of the most favourite internet destinations for all net users. 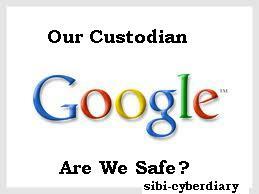 Google offers a host of services under its umbrella such as web search, mail, photo sharing, groups etc. One can search and contribute content, and communicate each other through Google platform. As millions of people use Google services to communicate and transact, it is necessary to ensure high standards of data protection and confidentiality. 4. Telephony log information like our phone number, calling party number, forwarding numbers, time, date and duration of calls, SMS routing information and type of calls – all are tracked and recorded. 5. Google can collect and process information about our actual location, like GPS signals sent from cell phones and other wireless devices. Google may also use various technologies to identify the location with the help of nearby Wi-Fi access points and cell towers. 11. Even after we delete information, Google may not immediately delete residual copies from their active servers and may not remove information from their backup systems. 13. If our Google account is managed for us by a domain administrator (for example, for Google Apps users) then the domain administrator and resellers who provide user support will have access to our Google account information (including our email and other data). The domain administrator can also restrict our facility to delete or edit information or privacy settings. 14. As per the Google’s policy, ‘it can provide our personal information to all the Google’s affiliates or other trusted businesses or persons to process it’ for Google, on a request by Google. What precautions you should take to protect yourself? Don’t give consent by default for combining Double Click cookie information with personally identifiable information. Set your browser to block all cookies, including cookies associated with the Google services. You can also activate the option to notify to you when a cookie is set by Google. Many times, when you click ‘No’ to the question ‘enable cookies?’, you may get a message that ‘the images will not be displayed’ or ‘files cannot be downloaded’. You need to exercise the option wisely. Google track your preferences through cookies. Is it necessary to have personalized search experience at the cost of privacy? In any case, you should periodically delete the cookies from your system. What will happen to our data stored by Google, if it collaborates with another company or enterprise? Google is silent on the above. It just says that if it is involved in a merger, acquisition, or asset sale, and if our stored personal data is transferred, then Google will give notice to the affected parties. There is lack of clarity in this. How Google will ensure non-disclosure of our data and prevent sharing of information to third parties by its own employees, contractors and agents? Google says the access to personal information of users will be restricted to Google employees, contractors and agents and are subjected to ‘strict contractual confidentiality obligations and may be disciplined or terminated they fail to meet these obligations’. It is not known what mechanism Google has established to detect such violations (before the user becomes aware of leakage of information pertaining to him). Google also needs to disclose to the internet community, number of such violations detected in the past and action taken. I searched Google (without logging in) to check the availability of air ticket from Bangalore to Thiruvanathapuram and clicked search results (including that of Indigo Airlines and Air India), just before writing this article. I switched off the laptop, had an hour of afternoon nap, went for shopping, and had a long evening walk. After dinner, I started browsing Washington Post . Do you know, what was the advertisement that popped up on that site? “Fly from Bangalore to Thiruvanathapuram at the lowest airfares. Book Now”. Should I be happy to have an online well wisher who is very concerned about me? Or should I get irritated over the overzealous uninvited cookies that track my interests and preferences? Yes, I was not very happy for the unsolicited assistance. Because I am yet to become an ideal man and the society I live is yet to become an ideal society! We live in the indispensable world of computers and any crash leads to instant tantrums. One fine morning, I found my PC sick. All my home remedies did not work and the comp continued to ail for several days. The General Practitioner – a neighborhood boy............Read more..
Leave Me Alone: Privacy in a Snooping World! Your comments on online privacy are welcome!